Manuel Tardits, architect and author, asks, “[is] talking about single-family detached houses the same as talking about Tokyo?” It is a question that attempts to reconcile the idiosyncratic motivations of a city’s inhabitants with that of a larger worldview of place. And yet, the fact that this query sits within the text of Tardits’ recent book, Tokyo: Portraits and Fictions — a dualistic conundrum in and of itself — a shift can be made in the focus of this argument, from discussing a city built from the outside-in, to one built from the inside-out. This provides a reading of the endemic issues of ‘community’ facing Tokyo by narrowing in on the psychological and spatial conditions circulating from behind the facades of this city’s houses. How then should the private lives of individuals and families be spatially constructed? As an affirmation or fantasy? Can particular internal, spatial typologies promote civility, cohesion or even empathy? 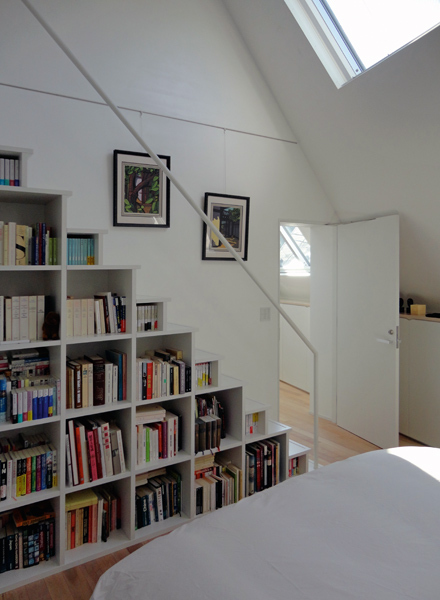 Should the spatial organisation of the domestic interior reflect the city? Or should it draw from the personalised ‘spatial intelligence’ of the owner/inhabitants? What if the culture is not of your own? What if you are not of the place? How then should one reconcile the knowledge of conflicting spatial patterns? 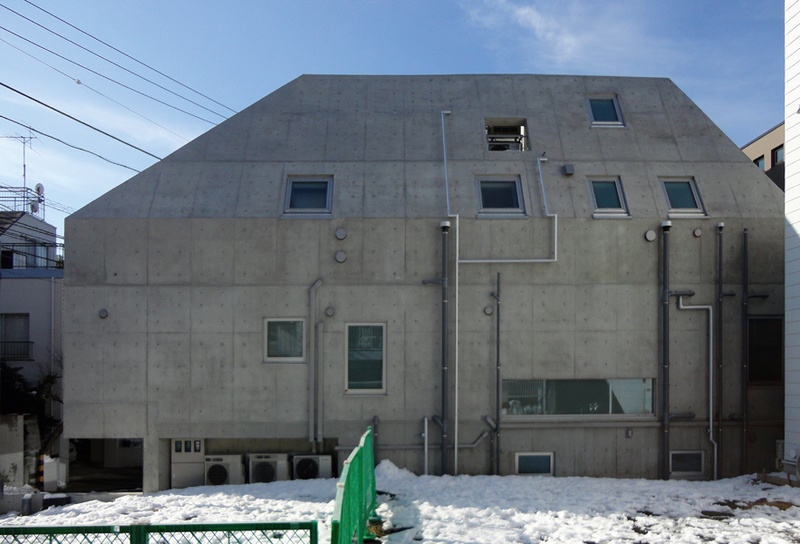 MIKAN, a Yokohama-based architecture practice, has designed a house embodied with this argument while negotiating the very specific spatial demands of the client – in the end providing a provocative example of how the architecture of the single-family house can be the subterfuge for omitting the city. 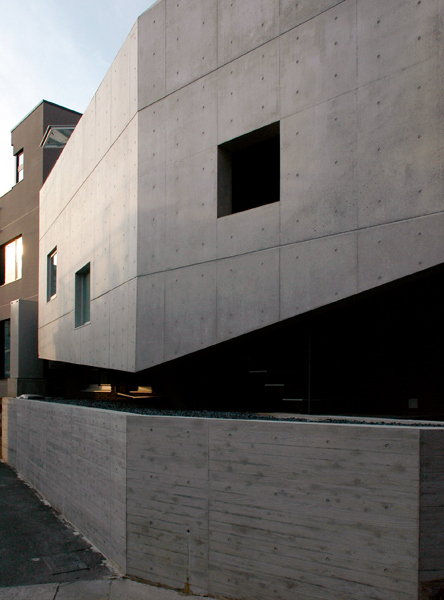 The clients, both scientists, French and Japanese, with two children, sought out MIKAN to develop their permanent domestic haven due to the practice’s unique mixture of French and Japanese designers. While the end result is a typical collaboration with the MIKAN members of Tardits, Kiwako Kamo, Masashi Sogabe and Masayoshi Takeuchi, it has been Tardits – through a process conducted primarily in French with the husband – who has refined a scheme that was finally settled on. While at the time, this was a simple matter of familiarity and convenience, it unintentionally aided in directing a particular spatial typology, one more representative of French architecture than of Japanese. When first entering the home, you are presented with a set of stairs winding up into a stairwell. In fact, this cage d’escalier is the central core from which the entire 314sqm hôtel particulier, or mansion, revolves. Initially intended to be an exposed internal patio, the now skylight-lit shaft has become the spatial link to four self-contained ‘apartments’, albeit without individual cooking facilities. The home’s three storeys, basement and rooftop terrace provide spaces of seclusion for the maid, guests, children and couple when doored-off at their demarcated thresholds. On the third floor, in the vaulted, communal penthouse, family members can gather. It is here the kitchen, dining and living areas have been concentrated. Built-in cabinets and a sofa assist in maximising this 51sqm space. As throughout the entire house, the meticulously detailed, custom-designed furnishings are one of the distinct characteristics of MIKAN’s architecture. It is in this spacious interior that one is made especially aware of the clear natural light that is softened by the maple wood floors – all windows at the lower levels, except the children’s bedrooms are translucent – however views are directed only to the high wire cables and rooftops of surrounding buildings, with any possible acknowledgment of city life trimmed from sight. Even the inclusion of a piano nobile (a designation for the premier floor) can be found on the first floor – somewhat diminished in size and stature. This 9sqm room, with a telescoping partition, injects a neutral zone between the children’s and guests’ areas. It also provides a space for displaying the couple’s collection of art and will eventually be furnished with an actual piano for teaching the children how to play. 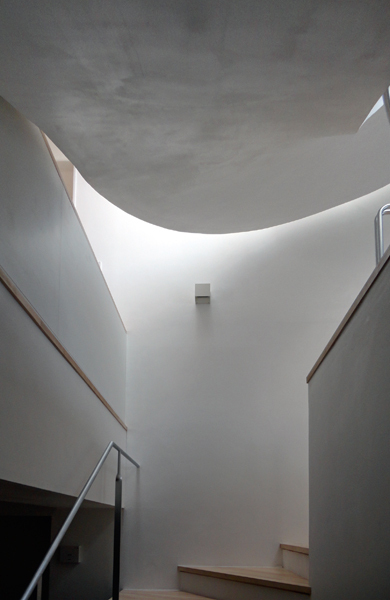 On departing the house, once descended from the main entrance, from underneath the hollowed out recess of the cantilevered portion of the structure – an unusual condition of being outside while still being inside the building’s form – one recognises this transitional interlude as actually the initial stage in the grand ascension to the top of the house. Beyond the clever spatial enveloping, it is the first evidence of a retreat from the city: an interstitial space of placeless anticipation. After experiencing the interior, confronted once again with the house’s exterior, one cannot help but see its form with Paris’ Haussmannian ‘street wall’ overtones, specifically in the dramatic hip roof, which is reminiscent of a mansard roof, minus the dormer windows and garret rooms. 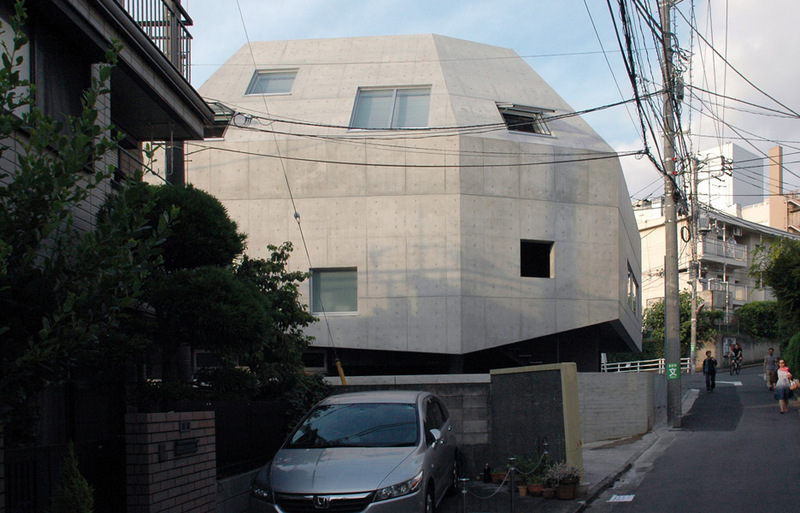 Remembering that one is in Japan’s capital, not France’s, in actuality the house’s exterior, while familiar in its neutral, concrete form, when approached from the southwest, along a short incline, the entire volume appears to dynamically heave forward with the illusion of hovering over its base. Against the eclectic patchwork of a typical residential ward, the modesty with which this large form sensitively hugs the 161sqm corner site is refreshing. 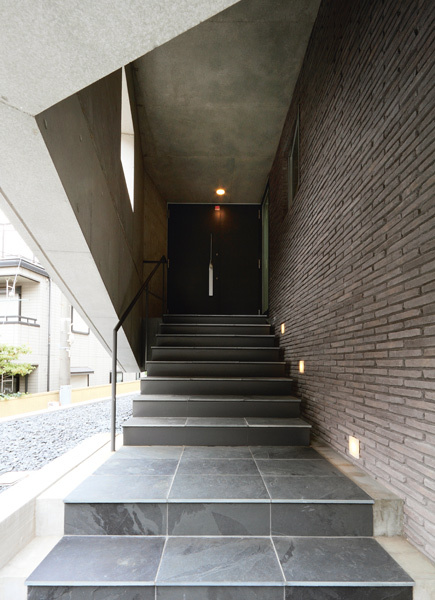 MIKAN, a practice with eighteen years of experience and close to fifty built houses in its oeuvre, is part of a circle of Japanese architects who are engaged in an open debate over how to address the detached house/urban fabric issue. The exhibition Tokyo Metabolizing by Koh Kitayama, Yoshiharu Tsukamoto and Ryue Nishizawa, for Japan’s pavilion at the 2010 International Architecture Exhibition at the Venice Biennale, provided compelling propositions for reinstituting community cohesion. The attempt was at reconciling a house’s or residential development’s placation of its inhabitants’ detachment from their surroundings, relying more on reassessing massing/easements, potentialising unused gaps and blurring boundaries between indoor/outdoor and territories of ownership. Absent was a full unpacking of the contemporary interior, spatial systems of private living inherent in the supposed disfunctionality of urban communities. As Tardits reminds us, one person’s perceived disfunctionality is another’s living sanctuary, no matter how removed from the local culture… just outside the landing from the front door. To quote him again, “Tokyo today, therefore, is an anthology of personalised bourgeois anecdotes, such as the architect Kojima Kazuhiro refers to derisively as ‘watashi no chisana shiawase sekai’, my own small happy world”. The 10 Star home: Australia’s most sustainable home?